GET IN THE SHOT TO PROVE YOU WERE THERE – THEN YOU CAN SELL IT! LOCAL PHOTOGRAPHER TRIPS OVER HUGE ALIEN LOOKING FISH STRANDED ON THE BEACH. SAID THE FISH SPOKE TO HIM AND MADE STRANGE SIGNS IN THE SAND! Fish and chip store owner Spud Haddock was down to the beach soon after he’d heard about the photographer’s encounter with “Rocky” and had his photograph taken which is now proudly on display at Spud’s eatery. “I was there, I saw it… I even spoke to the fish!” Spud commented as he re‐wrote the menu for that evening. Police are now looking for the fish that suddenly vanished later that day. want them to buy into your tour or product offer. Historically I’ve found there is always someone who has done more, travelled farther than me. Then there’s me leading the pack from time to time. Your credibility might be fleeting when you make a claim, however within the time frame you have – go for it. Make the claim. Sell your credibility. Being in the travel industry for 20, 30 years does not actually amount to too much. What does matter is what you have done; accomplished, in those 20, 30 years. If you do have a destination niche focus then the fact that you have been there five times is not credible. Twenty times. Now the cred’ factor is rising. Twenty times and escorted 40 groups to that same destination – the credibility factor is up again. Photographs of you and each group taken as a last‐day‐of‐the‐tour photograph increases the cred’ bar once again. From here on you must be thinking about how to market your credibility. One way to do this is to create a poster and use it as a marketing tool in your agency window. If no window – then have it playing on your website’s home page. Push it out socially to your Facebook page and Tweet about it, too. Click to play If you happened to video your last trip / adventure, then be sure to add a video link play arrow on the digital version of your poster. When your client sees and hears you screaming at the top of your lungs when you hit that white water – they’ll want in. Just don’t be caught screaming “Mummy!” or cursing. That would decrease your credibility to the factor of zilch! Star Power Let’s make you the credible cruiser. I know some people in the trade have cruised 150 times. Now, if that was the same route time after time, the credibility factor is falling. However, if there were one or two odd ball cruises, exciting destinations and even video footage of a rogue wave – well now you have something to shout about. Your star power goes up based on the level of difficulty performed! Also, you can gain star power by being photographed with the ship’s captain for instance. Press Power No time for being shy. If you truly want to raise your credibility factor then you must be contacting the local press to tell your story. If so, then you should be shown in the picture about here and here too Okay, perhaps not the volcano but for sure on the pathway and looking towards the Taj Mahal. That image would then give you the been there credibility you need and want. This is the essence of travel photography when it comes to selling the destinations you have visited and plan to visit. You can tell people you were there, but were you really there? You can write about a place as if you had just returned from strolling along it’s local streets, but were you really there? Not only is your credibility at stake here, so is your believability. When the consumer has a choice between you and your competition they will choose the agent that can demonstrate they have been, seen and have the t‐shirt, postcard and picture to prove it. Once you build a bank of ‘you in the shot’ images, you start to write a list of slogans that you can use with each image. One image can sell many types of travel. The image of the Taj Mahal obviously sells India. It could sell only Delhi, or it could sell a tour of monuments such as the Taj Mahal or it could sell a world cruise excursion or a tour around India, Asia and Australia. It all depends on the slogan you attach to the image featuring YOU! Joking about the volanco, but not really. Call it a mountain. If it was a mountain then for sure you’d want a picture of you on the summit like this one of me in the Rockies. Let’s set a ratio here. For every ten pictures you shoot, one of them must have you in the shot and looking good! Good meaning you can use this image to help sell travel. That means no devil hand signs, no MMA tongues or anything else hanging out. What we want is to see YOU doing what you are telling and selling others to do. If you sell cruises – you’d better have a few snaps of you leaning on that railing. Selling adventure? That’s you hiking the trail. To make sure this can happen even when alone, you need some gadgets. Planning to record yourself in the shot As you can see here, I was always in the means having the tripod to support your shot and it’s worked out well for me. I can camera and a wireless truly show and tell remote control. that I did what I did. I’ve seen what I’ve Only a few cameras seen. So that’s me come with a remote posing at the control. You may “kitchen” as I whip up have to buy the some hot water on approved device for one of the original your camera. Your Primus stoves that used gasoline as the local camera store will advise you. fuel source! Lake District, Cumbria, UK At Joby.com you will If you travel with find a selection of Gorilla tripods as shown someone else then you have a built in below. These are very stable and also wrap photographer to snap you whenever you around posts, branches and poles. want to be factored into the image. If you step out alone from time to time you will need a remote control ‘clicker’ and a tripod or stand or stick, rock, shoe… When photographing yourself remotely, http://joby.com/gorillapod check what is behind you. No poles zooming out of the top of your head for instance. iPHONE users can search for the Belkin LiveAction Camera Remote App – you’ll As the owner‐manager ask each member of download the LiveAction App from iTunes. I your agency team to also take photographs have this device and it works well for both that feature them in the image. Build a file stills and video. So there you go. You are in of ‘been there seen that’ images and you’ll the know and in the picture from here on. be very thankful you followed through. No excuses for not being in the shot. Also pick up an Don’t forget to record where and when the XSHOT shown image was taken. If you purchase a new here. You can point‐and‐shoot camera today many of walk and talk them have GPS location software built in and shoot. that will tag the image for you. What you are looking for here is that one image that does the job in terms of causing a consumer to stop, look, look some more, think WOW! and then look for your contact information so they can obtain more information. That’s what a single seller image should do. It is actually a ‘must do’ – every one of your images should stir the emotion to travel. When you locate an image that, by itself, sells the destination or the type of travel you are selling, your niche market or your new tour, hopefully the image is yours to use. By that I mean there is no copyright infringement or legal suit coming your way if you choose to use it. This is important and one of the most dangerous outcomes of using images found on‐line. Start a collection of your own images, ask your clients for their images and tap into all the existing resources that your preferred suppliers offer travel agents. You want to procure images that are free of charge whenever possible. From time to time you may want to purchase an image from a stock photo website and a one time use is not expensive. A matter of dollars unless you want to purchase the rights to the image – then you will be investing hundreds of dollars. This can be an easy thing to do wrong. Be careful with the type style, font size and text colour you choose. If you lack a creative eye, ask someone else to spec your creation. Ask three or four people to round out the response. You want input. You do not want people to be nice as that can be the route to no sales. Ask for an honest review. Most photographic software offers an ‘insert text’ application. You click on that app and then spread a text box over an area of the image and then type in your slogan or call to action. Remove the line around the text box, click ‘save’ and you are done. If you do not want to be reached, we can help. If your photographic software doesn’t offer this type of app then here’s a simple way to set up the text‐on‐image concept and then use your photographic software to crop the image. Cropping is part of all photo software. Here’s a low‐tech method I use when I am producing images, so it should work for you. Open MS Word or MS PowerPoint and click New. Both allow you to import an image and both have text options. Click Insert, browse to the image you want. Highlight it and click Insert. Next: locate the corner handles where you will be able to enlarge the image by clicking on the corner handle and dragging the image to the size you want. Next: Now you select a Text Box and drag that out to the size and best location on your image. Save it. Imagine… Next: Print Screen (Ctrl.Alt.PrtScn) or use a screen capture program. Save to desktop or clipboard and your image with text is ready. Most artists and photographers understand balance and placement when it comes to composing their images. Using “thirds” means splitting the image up into thirds as shown on the image below. Rather than have your subject dead center in the image, those that know tell us to have the subject slightly off center. When you look through your lens try to envision the grid you see below. When you control the layout of your image this way you can also control what you want your clients to focus on. The photo of me with my camera might cause people to think “I wonder what he’s photographing?” and then in the next image you could reveal the scene. Then there will be times when you go against the third eye advice and put your subject slap bang in the center for more impact. You might also want to zoom in on one part of a scene to make sure your clients see the main reason for visiting this location. Also, when you follow the third eye rules, you’ll be giving yourself that much needed space to add text. Are you a story teller? You must be – you’re a travel agent. When you return from your next FAM trip try to write your report in a story‐book format and then work with a graphic artist or use one of the graphic novel software programs to generate a new promotional tool that will help you SHOW IT AND SELL IT. When you work with a graphic novel layout The Flip Book software will allow you to you’ll be using the type of layout you see save and publish your graphic novel online. I use ISSUU.COM and the basic account is below. You can add your own images, cartoons, sketches and speech bubbles to free. Create your graphic novel, upload it and then tell the world where to find it and tell your story. read it. Your graphic novel now becomes your selling brochure. You can even have a poster printed featuring the cover of the novel. Think larger than you are here – do what the big guys do when promoting a movie. Posters work. Social media announcements work. Buzz works. A graphic novel is a genre that will attract a new and younger traveller. As some university text books are now in the graphic novel format, your new publication / travel brochure will strike the right chord with this generation all the way up to Gen X. Back to story telling. The content of your graphic novel should be on the right side of Once you have created your graphic novel decency. Hold the nudes, the curse words what then? Well – you can publish it online and the blood and the gore! That’s a you can post it on your social media different kind of graphic novel. The one channels and you can even make a movie we’re talking about here is family oriented. out of it to upload to your YouTube It’s a travel brochure in a graphic novel, channel. cartoonish, manga‐rish format. For content you would use your own A current topic you images taken during the FAM and also the may want to think images your suppliers can give you. You about is cruising. It’s might also ask your clients if they would like been in the news so to appear in your graphic novel. If they much that you could agree, have them sign a release form and ride the wave that’s then get busy. Use your own face as a still rolling out cartoon character and if your clients are up there. for it, ‘toon’ their faces, too. If you go with the cruising theme you could write about your most recent cruise, you could write about all your cruises to date. The recent cruise mishaps all point to travel safety and here’s a cover that might inspire you to put your cruise safety novel together and then pitch it to your clients. This cover speaks to kids that cruise, which in turn means parents, too. The number of pages can be just a few – 5 to 10 max. You are not really writing and publishing a full blown novel. This is meant to be a small and relatively easy promotional tool to showcase where you’ve travelled and help sell that destination. You might even be able to attract supplier funding to create your graphic novel or at least make use of their graphics department. Ask the question. Here’s a series of captain mug shots I created by shooting myself (!) and then cartooning them in Elements. What is it? Where to find it, how to use it and how to profit from it. Price USD$39 + Taxes includes 60 minute webinar presented by Steve Crowhurst, handout and recording to view at your leisure. There are many social outlets where you can post your images and promote travelling to the featured destination. First things first, you’ll need to establish an account with the major social networks. When that’s done, it’s upload time! Although the focus here is on photographic images featuring YOU, we also know from so many surveys that the consumer actually prefers video and that does make sense, plus the sights and sounds will help sell the featured destination. If you can handle speaking on camera then you may wish to upgrade from being featured in a static image to being the prime actor in your own travelogue. If you are not easy in front of the video camera then perhaps someone on your team could become the spokesperson. Ask your team and see who responds. Here comes the challenge. This is not about “looks” – it’s about on‐camera personality. It’s about presence and voice, timing and the ability to put a message across in such a compelling way that it is believable and attractive. When making the decision to go into movies you do not need expensive equipment. Even your basic point and shoot camera will shoot 720 or 1080 HD. Good enough to start with. You can upgrade to the semi‐pro video cameras later. Next you’ll need to invest in video editing software. No need to splurge yet and your version of Window comes with Windows Movie Maker. That’s all you need for the moment. If this was your photo‐site you would design it to sell your niche destinations like Mexico, or Argentina, or Ireland by adding logos and ‘come with me’ text. POSTERS. Today you can print a quality poster 36” x 24” for cheap. That’s the only word for it, cheap. EGYPT is yours! Choose your best photos then visit your local jumbo print / poster print shop and print them. If you print your posters all at the same time you should be able to obtain a discount. The image is one thing, the call to action is another. Make sure you add your slogan to your image so that the wording appears on the poster. If the poster is a winner in every sense then chances are you Come with me on (date) could sell copies for framing to your clients. FACEBOOK COVER. Changing your Facebook cover image is something you should plan for each month. When you decide to promote a new location, destination or tour departure make sure you insert a ‘been there / seen it’ image featuring you and a well worded slogan. Facebook does not actually allow call to action statements so you’ll need to be clever in how you phrase your slogan. (Refer Egypt image.) LINKED IN BUSINESS PAGE. If you have a LinkedIn account, open a business page and edit it from a sales point of view. You can upload an image there, too. So that’s a poster in the window, the same image uploaded to your Facebook cover image area and the same image uploaded to LinkedIn. PINTEREST. Keep uploading that image. One more stop here if you have an account with Pinterest. FLICKR. Same again although here your imagery is going to get lost. Millions of images here so nothing is specific to you. If you have the time perhaps it’s worth the try. This could be the location for your photography website. SLIDE SHARE. Create a presentation with excellent call to action slogans throughout. The last slide asking for the viewer to make contact with you directly. T‐SHIRTS. A good old standby. If you are active in the community and the weather permits it, wear a t‐shirt emblazoned with your image and slogan. Sketching Tour of South East England. in Bilbao, you might list as key words “Spain, Guggenheim, Bilbao, Biscay, Basque ”. In the world of travel presentations, the use of key words can help paint the image of the destination in the mind of a client, to either replace images on a temporary basis, or to create anticipation for upcoming images. Let’s think of Thailand. Another popular technique for painting images in your client’s mind is the use of Word Clouds, which you can find at www.wordle.net. In Figure 1.1 you can see my cloud showing all the places I’ve visited in Japan. Travel agents can create a Word Cloud for any destination, or gather words from your client and put them into a colourful Word Cloud (for example their reasons why they want to travel, or their thoughts on adventure). It is a bit of a gimmick but having you, the travel agent, print up a cloud for your client helps in the visualization process based on the powerful images that each word conveys. This impacts the mind and transforms the concept of travel, into the imagineering of the client to actually be on site at the destination. A travel agent can use pictures, they can use words of pictures (key words), they can use pictures of words (word clouds), they can use moving pictures (videos) and they can use static pictures (Pinterest). Give your travel counsellors the BEST in travel marketing ideas, tips, tools and techniques presented by the guy who wrote the book on generating new business. 4‐HOUR QUICKIE to 2 FULL DAYS No one else but Steve can deliver this one‐of‐kind jam‐packed program. That’s right. I’m giving two‐thumbs up for The Travel Institute’s CTIE program and recommend you check it out. At the same time look for my management webinars & workbooks that will indirectly support what you learn by studying the CTIE content. Click on The Travel Institute’s logo below for more information. Read TAM here. Here are the current outlets for SMP and SELLING TRAVEL’s publications and webinars. Click on this link and you’ll be able to join the ST and SMP mailing list. You can unsubscribe at anytime. Emails are only sent as and when there is something of interest to advise. Many of you are fans of the ST Facebook page and quite often this page receives more instant access and do it now ideas to help you generate new commissions. If you are looking for that type of information, click on the FB logo. CITC sells eBooks and manuals published by SMP Training Co., ‐ so be sure to check out the CITC Store – always new items being added. The Travel Institute carries SMP Training Co., eBooks, manuals and also presents webinars produced by Selling Travel. In addition they offer many more publications in their online store. 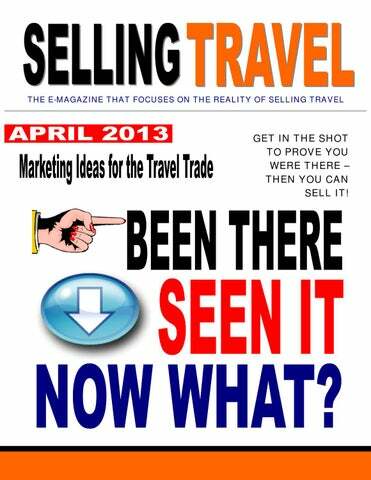 The Travel Agent Revolution sells SMP publications and hosts Selling Travel webinars. Training you to go beyond destination specialist to the next level of Destination Mastery. Book Steve Gillick for your next conference to drive home the importance of destination skills. 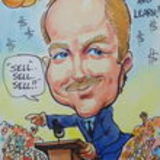 Let Steve help BOOST your profits by energizing your staff to sell travel like they really mean it.